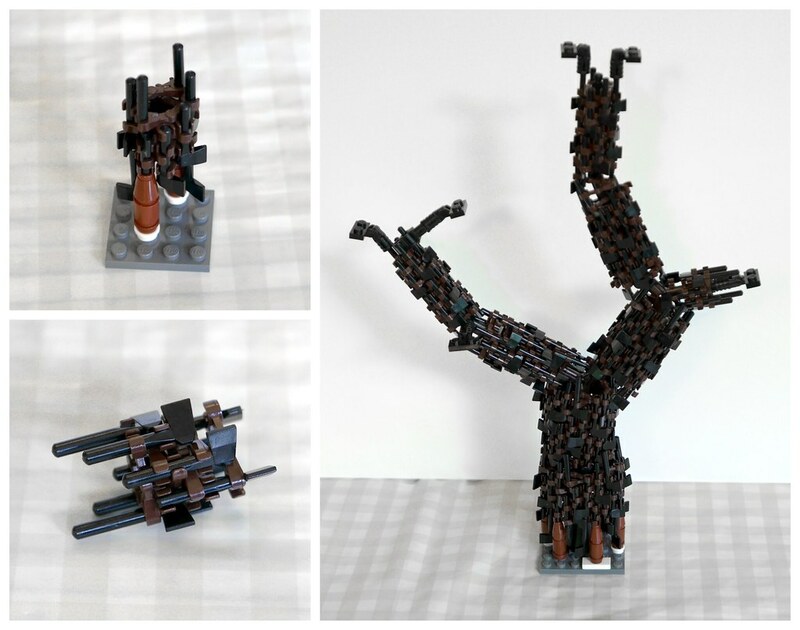 So, awhile back I created a new technique for making trees from axes and droid arms – the axe tree! 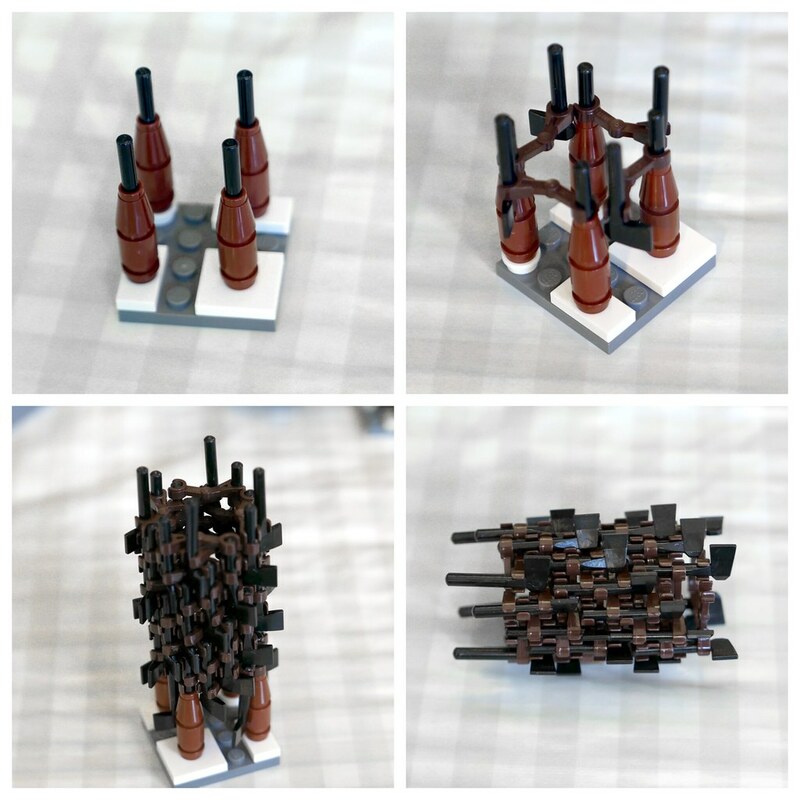 I have since been asked numerous times how these are built, but as the building process is quite complex I decided that a tutorial would be the best way to explain it. 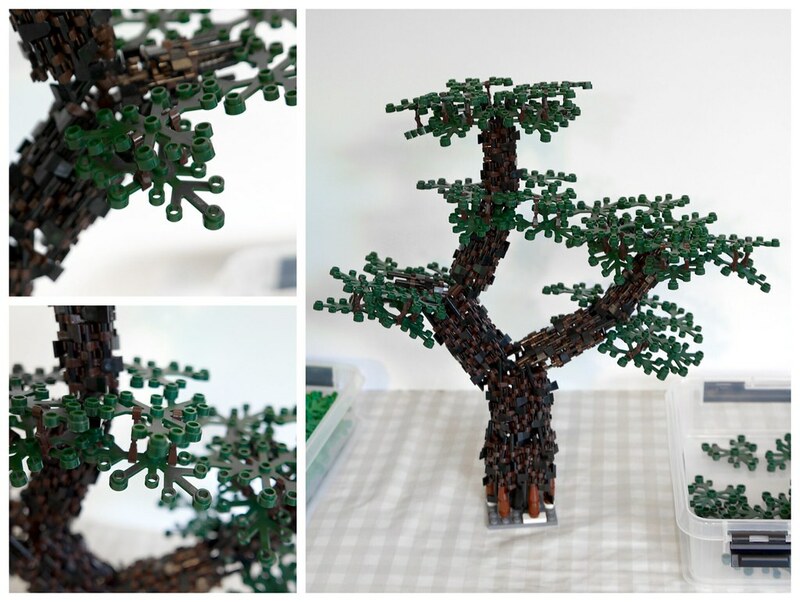 This is that tutorial and hopefully it will all be explained here 🙂 So if you want to try to build one of these trees – keep reading! Feel free to ask questions or give general feedback on the tutorial in the comments. First, let’s take a look at what we need. 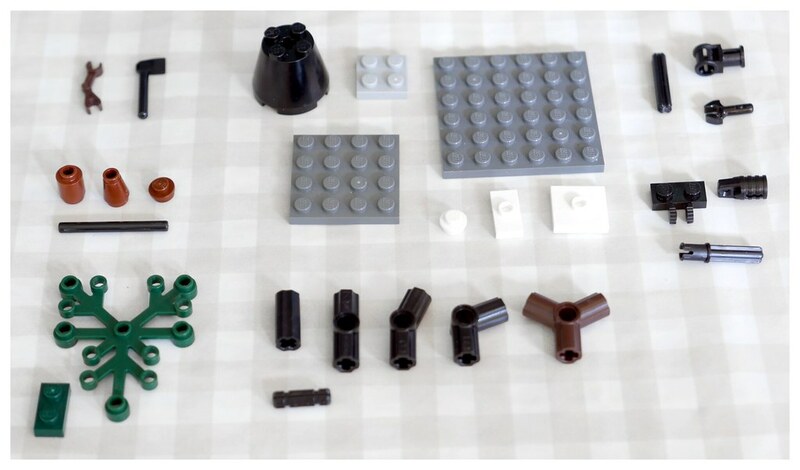 The different types of pieces needed are shown in the picture. Now this is only a rough list of what we need. Many of the items are not strictly needed and can usually be replaced by something similar or even omitted altogether. The items for the support structure can be varied depending on how you want to design your tree. 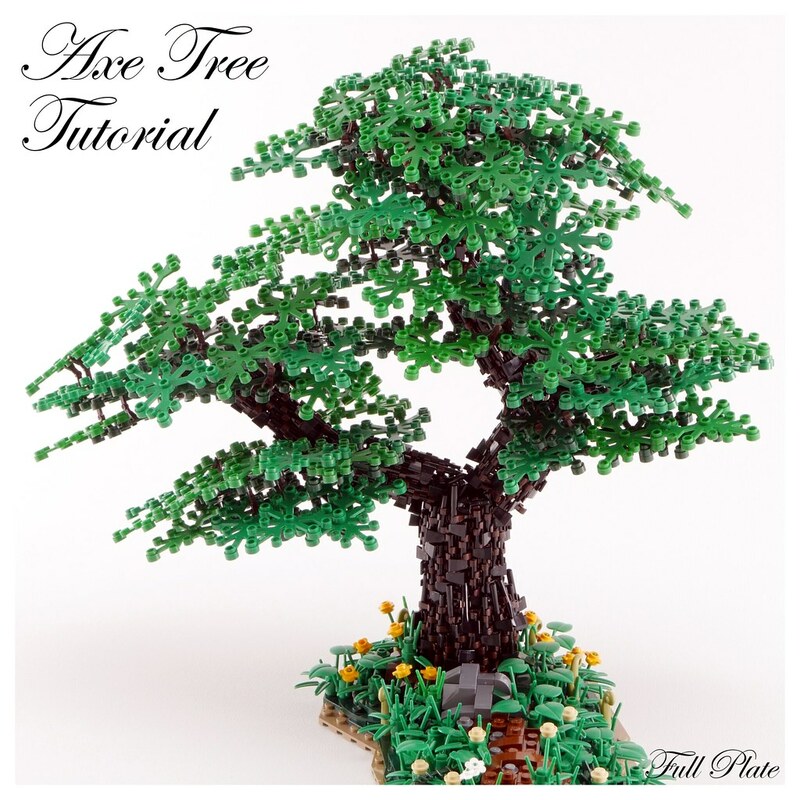 The items listed are what is needed to build the particular design in this tutorial, but as these elements are generally cheap I would advise to get hold of a range of technic connectors with different angles so you can design trees in whatever shape you would like. For the the foliage you can choose whatever color you would like. In this tutorial we will be using green and dark green. If you for some reason would like to use 3×4 leaves that is also possible, but I certainly prefer to work with 5×6 leaves and will not be using them in this tutorial. That is it for pieces. Let’s start building! So how are these trees built? The tree basically consists of a support structure, “dressed up” with bark. 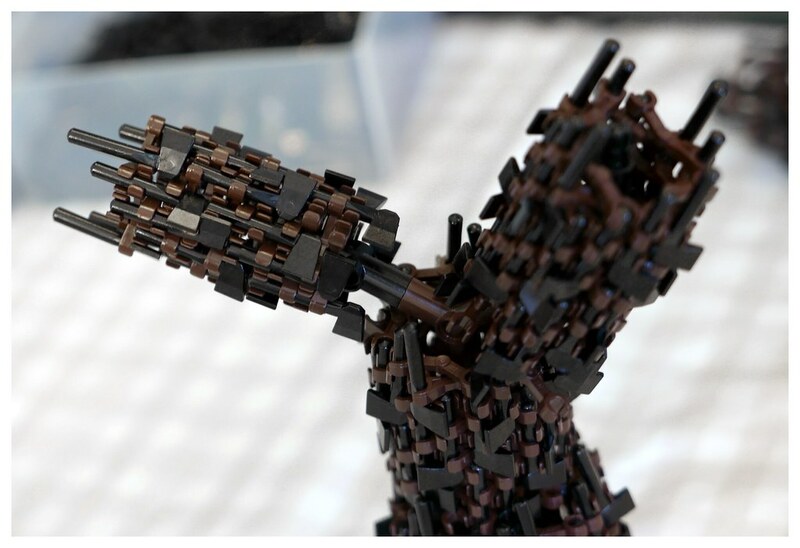 The bark is essentially tubes built from just droid arms and axes. Tubes can be built in different sizes. I will refer to a tube’s size as the number of axes in the circumference of the tube. That is, if a full circle of a tube has 8 axes, it is size 8. The picture shows tubes of sizes 8, 12, 16, 20 and 24. 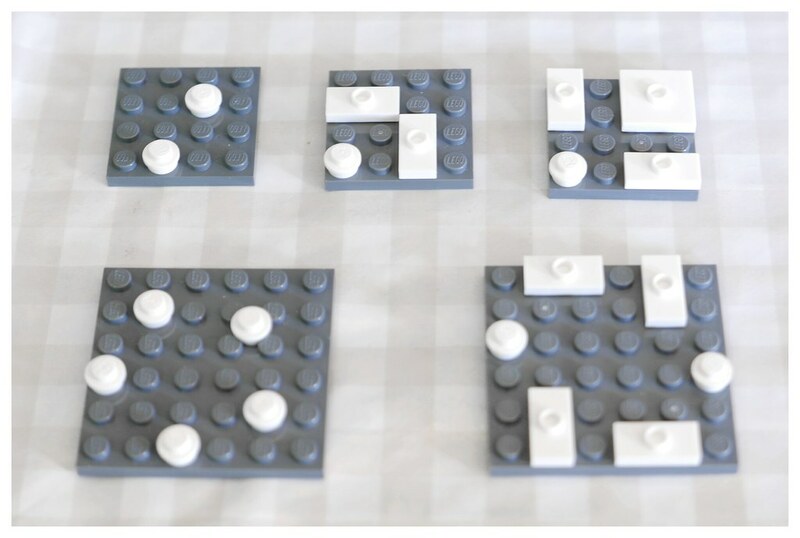 They can be built in other sizes as well, but multiples of 4 are easier to build. Size 8 is the absolute smallest that can be built though and the upper limit is somewhere around 28 or 32. First we will have a look at how to build the bark. In order to build the bark tubes we need to first build guides, which make the assembling process simpler. These guides are not part of the tree itself, and will be removed at the end of the process. In order to use the guides we build little pillars that we put on the guide plates. 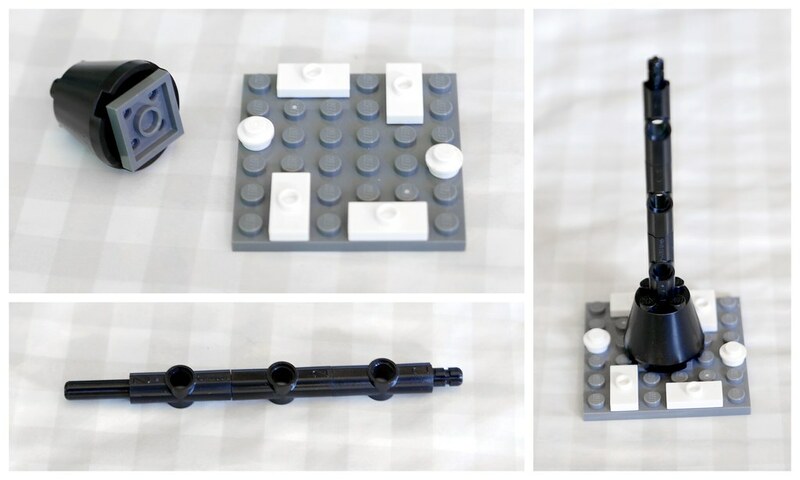 These are the connection points for the tubes and are simple to build. We need 6 of these for now. We’ll start by building a size 24 tube as this will be the bottom part of the trunk, so go ahead and attach the pillars to the guide plate. This is one of the main building blocks for the tubes. We will be building a lot of these. The orientation of the bend of the droid arm is important. I also think it is a good idea to connect the thicker side of the droid arm to the axe. This is because it makes for easier connection to the rest of the tube, as the thinner side needs less force to clip on. Another thing to note is that the point on the axe we connect to is thinner on one side, so the droid arm needs to be connected perpendicular to the axe blade as shown, or it will not stick. Go ahead and build 6 of these for now. Now we connect these to the guide as shown above. 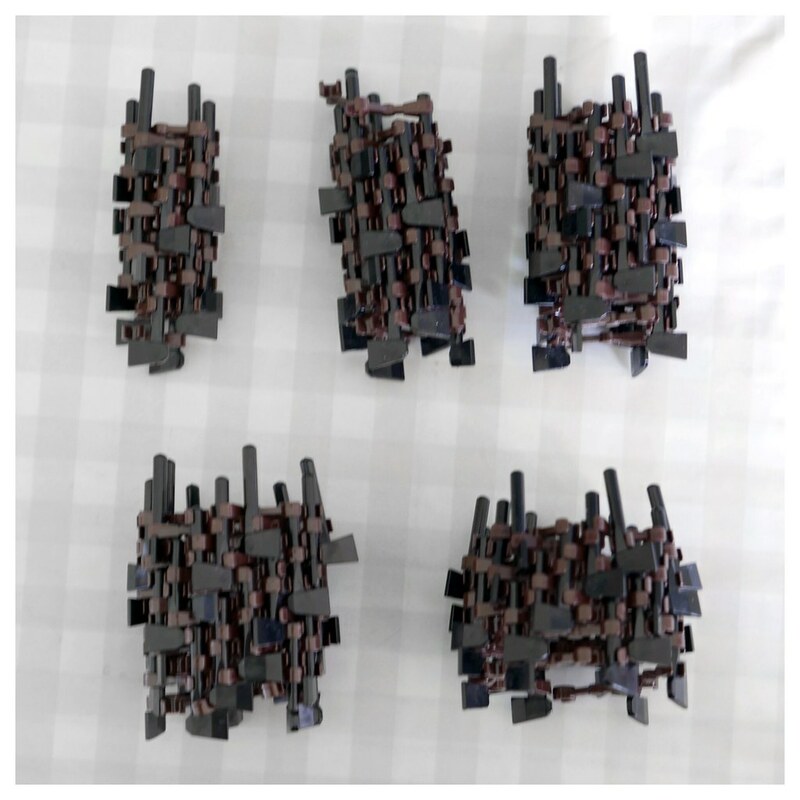 I find it easier to connect them pointing outwards as on the image on the left and then just rotate them in once I’ve attached all of them. Do pay attention to the orientation of the droid arm bend. The result should look like the image on the right. Now for something similar, yet different. We now connect the droid arm at the other end of the axe. Again, pay attention to the orientation of the bend of the droid arms. We need 6 of these as well. Now things get slightly more complicated. We need to connect these on the guide just above where we connected the previous parts. But we will attach it from the opposite side, and the bend will also need to go behind the axe that we previously connected. Do zoom in on the left picture to get a good idea of how it is connected. We will then proceed and connect all of the six blocks the same way. 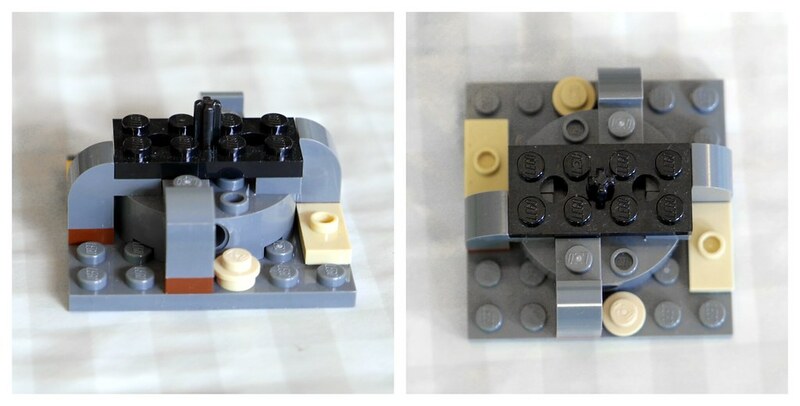 The end result is seen in the middle picture, and from above in the right picture. At this point there are only two steps left to building the bark tube. These can be repeated as many times as we want to get a tube of desired length. The first step of the two is basically the same as what we did in the beginning. 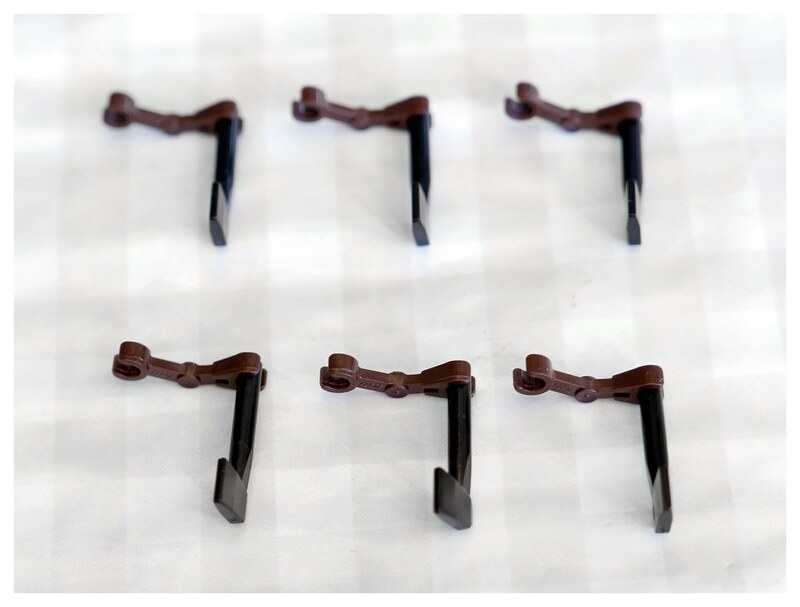 Attach another 6 droid arms to axes as in the left picture. We again attach these to the structure, but this time we connect to one of the axes rather than to the pillars. This requires a more careful touch and we need to apply counter pressure on the axe we attach to or things may fall off. 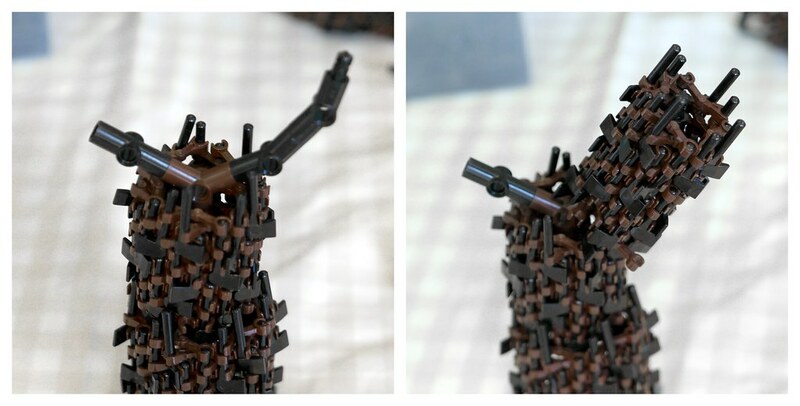 Note that the bend of the droid arms goes behind the bar of the pillar as seen in the middle picture. We will go ahead and do the same with the other 5 and the end result should be like the picture on the right. What we do is that we connect 6 droid arms to bars/axes all around the tube. 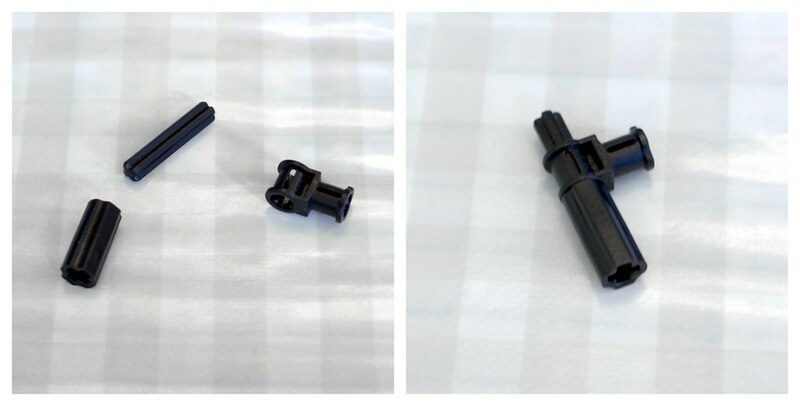 The left picture shows how one of these are connected. Now, in order to accomplish this connection I usually connect the droid arm to the bar on the left first, and then actually just push the other side of the droid arm down onto the shorter bar. This process is shown in the middle and right pictures. Make sure you attach the thicker part of the droid arm to the bar on the left as it is easier to push down the thinner clip. In subsequent repetitions of this step we will be pushing down onto axes rather than onto the pillars like here. This means we need to apply counter pressure with the thumb at the bottom of the axe we attach to, or the axe may slide down instead of the clip connecting to it. On the plus side, axes tend to have a rounded end which makes pushing down the clip on it easier. 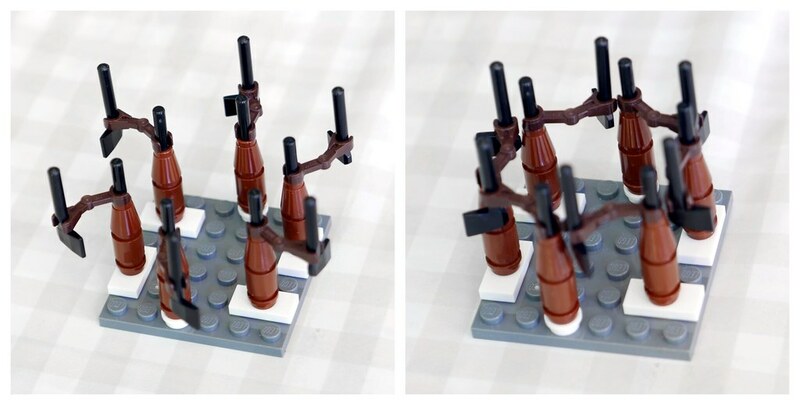 If you are confused about which two bars you should connect with the droid arms, just remember that the droid arms should be connected so that it goes behind the bar that is currently the tallest. Once you have connected one, figuring out the other 5 will be easy. Ok, so now we have reached the repetition stage. From here on out we just repeat the steps shown in the two previous images until we get the length we want on our tube. The top left, top right and bottom left, shows result of the next 1, 2 and 3 steps respectively, while the bottom right is the finished tube. Note that as we build the tube higher the axes tend to want to pull inwards. This is fine, and is because the bottom guide plate doesn’t match the natural size of the tube completely. The same goes for the pillars which tend to want to bend a bit to the sides, which is quite visible in some of the pictures. We don’t have to force them to stand straight, it is fine if they are a bit crooked. The pillars are there to help with the building, not to force it into a certain position. Now, let’s take a quick look at the support structure that goes inside the bark tube. 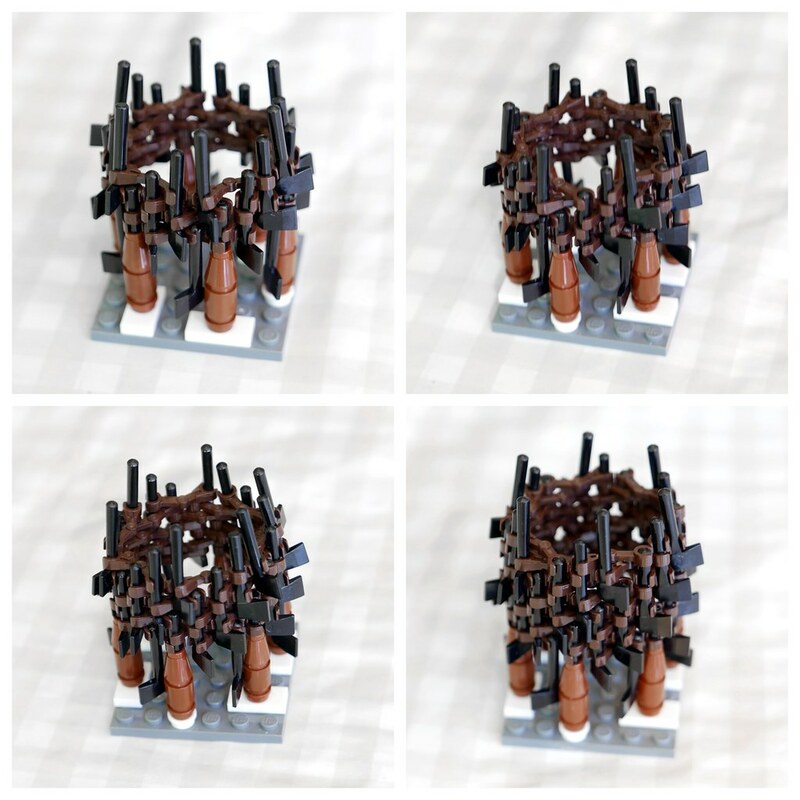 It is pretty simple and is built by technic connector elements. 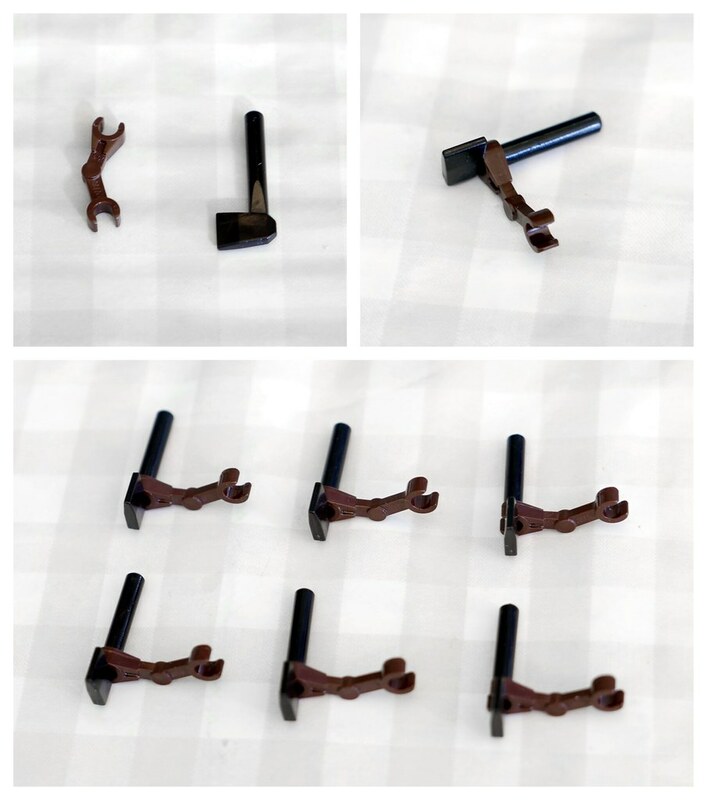 These do not connect to the tube pieces, but rather the tubes either hangs or leans on the support structure. As mentioned, the guides are not usually part of the tree. However, for the bottom part of the tree, a guide plate actually makes for a good connection point to the rest of our build. So we will leave the bark tube attached to the guide for the bottom tube. In the pictures the structure is shown without the bark tube to more clearly show how it is connected to the plate of the guide. Next we will attach this inside the tube we just built. Just attach the support structure inside the tube. Plain and simple! This is an alternative, and more stable connection for the support structure. The downside is that you will have to use a different plate than the one used to build the bottom tube on, which means we have to detach the bark tube when it is done and then reattach it on top of this instead. It also has only 4 connection points, which means 2 pillars will be unconnected. 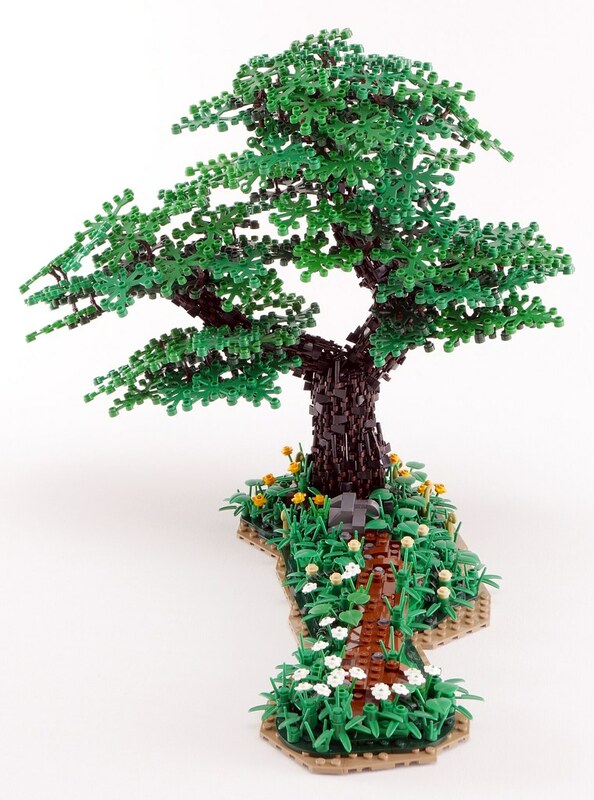 It adds a lot of stability to the support structure though, and I would advise using something like this if you are building big trees. The added complexity is worth it. Now, whatever your choice, we need more bark tubes for the tree, so let’s build them. First we will build a size 20 tube that goes directly on top of the size 24 one. We will be building this tube a bit taller than the size 24 one. 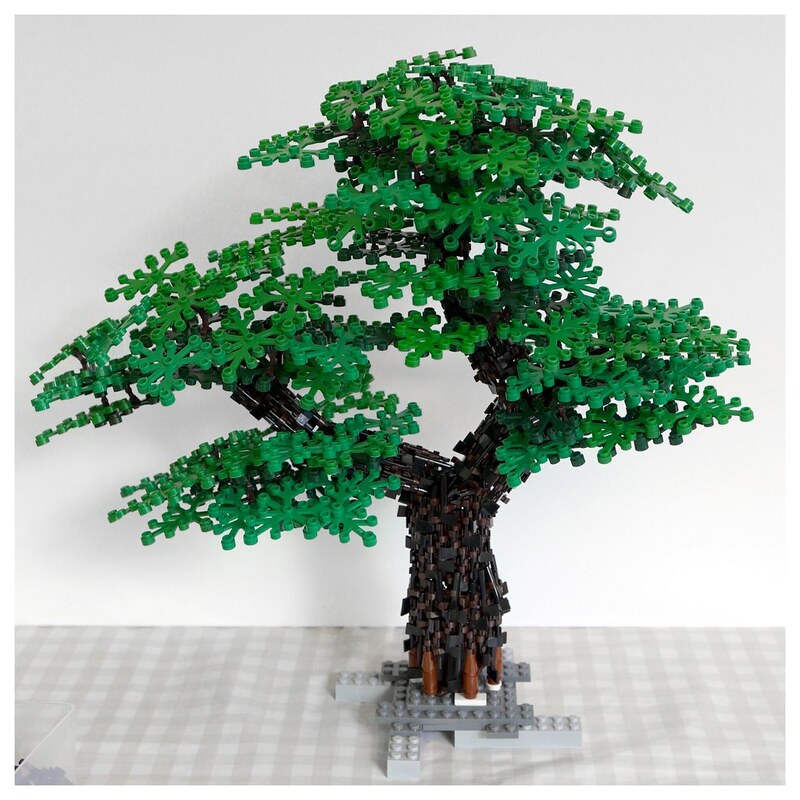 This is to make the tree look more natural as the thickness of real trees tend to have a higher rate of change close to the roots. The tube on the right is the result of 6 repetitions of the two building steps. We will now detach the tube from the guide. First, we gently pull the pillars from the plate, which will result in something like the picture on the left. The bottom plate and pillars may need some slight repairs afterwards. Second, we want to pull out the pillars from the tube. This should be done without harming the tube itself, which can sometimes be a challenge. The way I do it is to put my thumbnail in between the pillar and the first droid arm attached to it, and then pull gently. The result is shown in the next picture. Now, for each pillar you pull out, you will notice something loosening and perhaps even falling out. 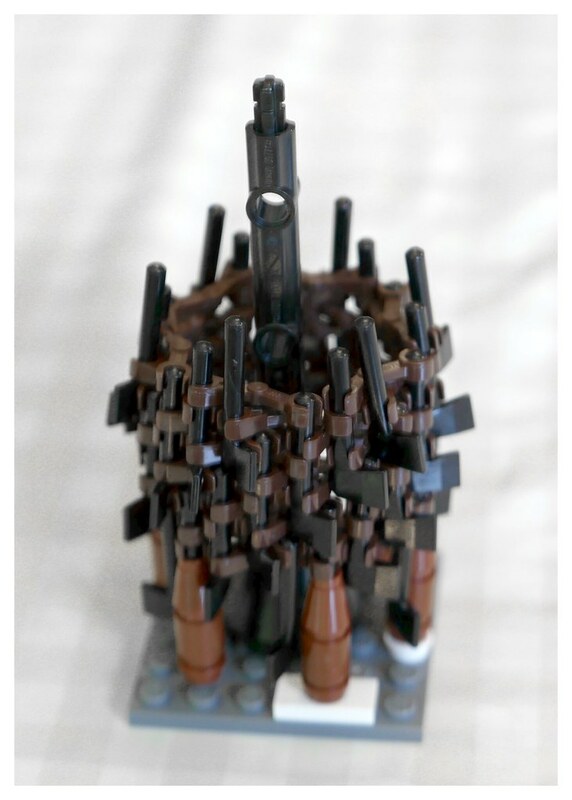 This is as it should be, and these pieces should be removed. The results of pulling out all the pillars can be seen on the right. You may have noticed that the axe heads on the tube points somewhat straight out, which definitely looks strange. In order to give the bark a smoother surface we now need to rotate all those axe heads in towards the bark. The axes can be rotated in two directions though, so which direction do we choose? We actually alternate the direction 🙂 This is because the axe heads are lined up in a diagonal fashion around the bark and it will look unnatural if we just push all the axe heads in the same direction. If we instead alternate, we will break the diagonal pattern, and instead we will have “patches” of axe heads here and there on the bark. There is still a pattern to it, but it is not very noticeable. Pushing in the axe heads may sometimes make the axe a bit looser. This is because the side of axe handle is smaller on the sides, so the clip attaching right under the axe head will not be firmly connected once we rotate the axe. However, since the tubes are quite sturdy it will generally hold together well anyway. The exception is the end parts of the tube, where an axe may fall off completely if we rotate it. So at the ends we just rotate the axes to whatever direction will still hold the tube together. It is time to add the completed size 20 tube to our tree. But we want to make sure it is somewhat stable and doesn’t wobble around too much. To do this we attach two 1×1 round plates on each side of the support structure as shown on the left. This will help hold the tube in its right place. We then add the tube to the tree. Make sure you put it in with the axe heads pointing down. Also, try to get the two tubes to interlock as much as possible. This is not that easy, as a size 20 doesn’t line up that well with a size 24, but by trying different positions and applying a little bit of force it is usually possible to make the two sit quite closely on top of each other. It is even possible to attach some of the loose droid arms of the top tube to some of the axes of the bottom tube, but usually just 1 or 2. Do also note the result of the axe head rotations on the tube in the picture on the right. 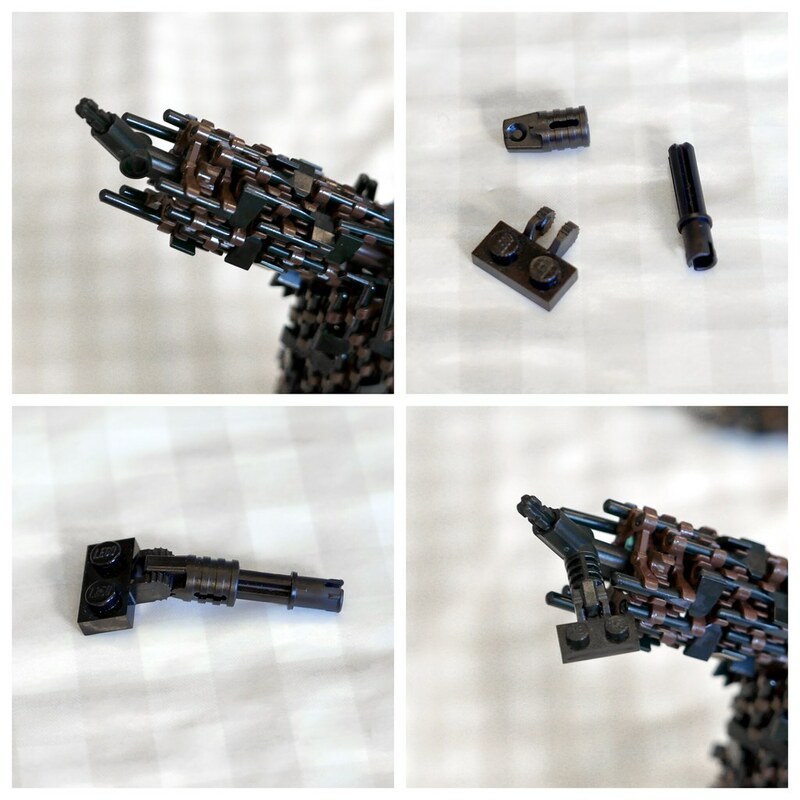 To do this we will use the triple technic connector shown on the left. We just attach it at the top on the support structure and it should look some like the picture on the right. From this stage onwards we may have to do some small tweaking here and there. This tree is not built with exact and precise connections, and each tree we build will be different. So don’t be afraid to change things up if they don’t fit as well as you would like. Even if the tree collapses, the tubes themselves are very sturdy and you can easily rebuild the support structure and add the tubes back. A little side note. 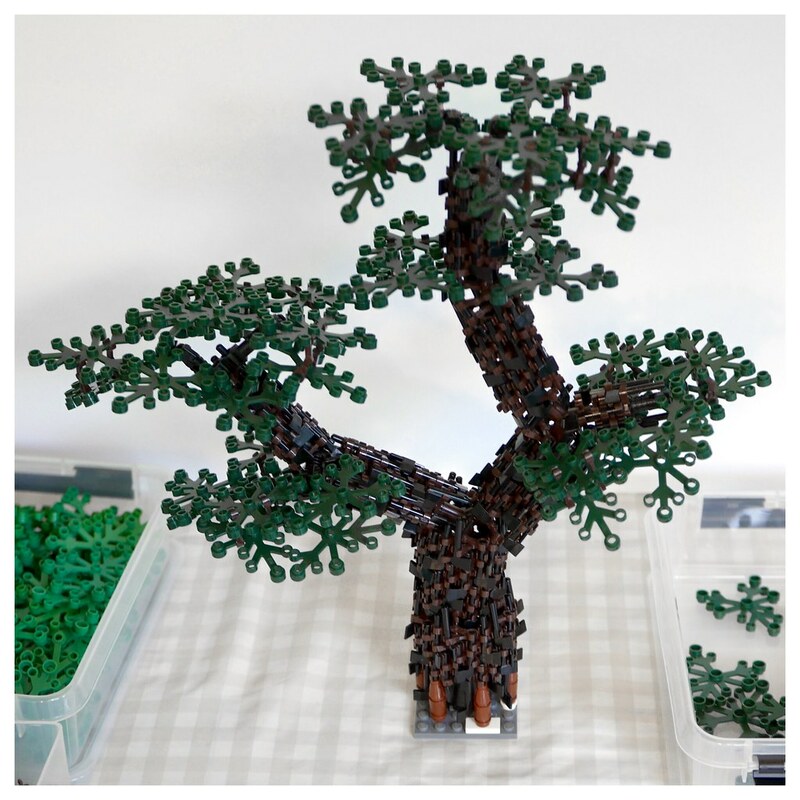 There are many ways to create branching of the tree. On this tree we used the triple connector, which branches equally on both sides, which is good for the balance of the tree. As our tree has branched, we should again make the bark thinner. We start by making a size 16 tube. This will be the continuation of the main trunk. Again, the process of building the tube remains essentially the same. 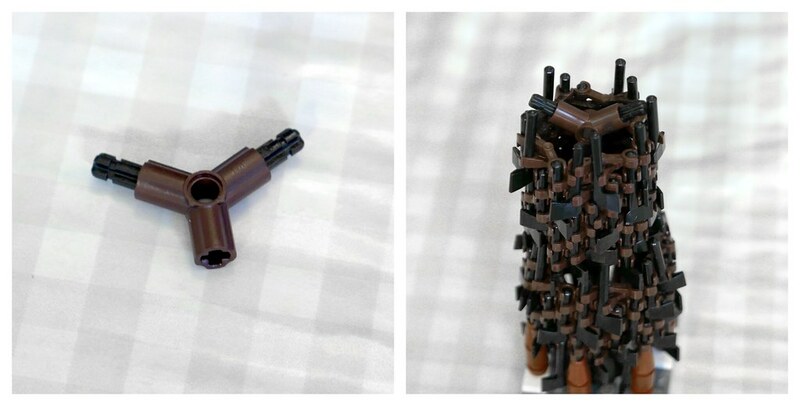 Just use the guide for the size 16 tube and get building 🙂 The result is in the bottom right. We also need a tube that will be our branch. We will make that one size 12 so it is thinner than the main trunk. I am not even going to show you the process of building a size 12 tube, as it is, again, essentially the same as all other tubes we’ve built. The result is shown on the left. We now have two tubes that are ready to be added to the tree. Now that we don’t have to worry about toppling our tree anymore, let’s add to our tree. On the right we will build a bend upwards as this will be the side where the main trunk continues. We will then put the size 16 tube there as seen on the right. Try to get it as far down as possible, to avoid getting too many cracks, though some cracks in the bark are inevitable and will be remedied later. So what is wrong? There are actually two problems here. Firstly, the internal radius of the size 12 tubes, as well as size 8 tubes, are too narrow to allow connector elements with pin holes through. 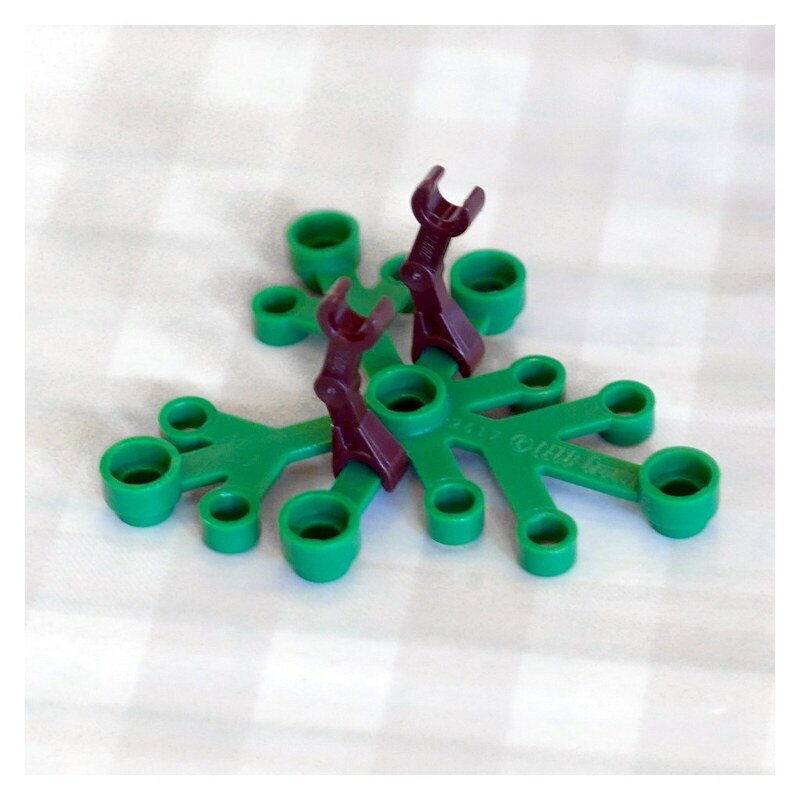 The only connector that fits it is the straight smooth one (element 6538c), so let’s go ahead and build the left branch out of these instead. We do also have another problem though, and that is that the shape of the tube doesn’t allow it to fit very well against the other tubes. So what do we do? We need to shape the tube in order to make it fit better. Shaping the tube basically means that we pull out some axes and droid arms to give the end of the tube a shape that fits better with our tree. 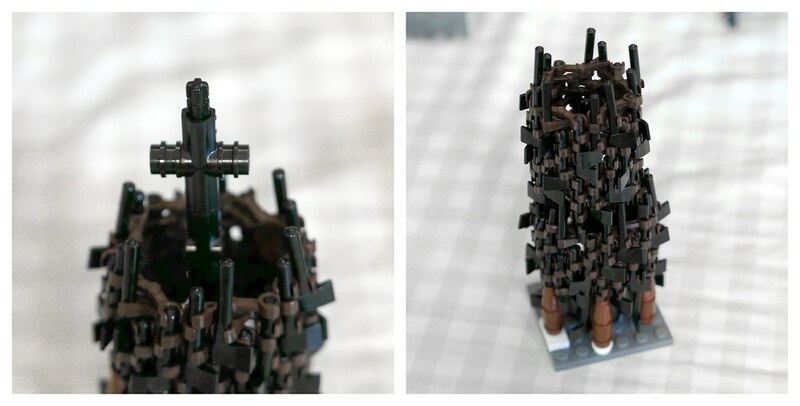 In the left picture I have removed 2-3 layers of droid arms and a couple of axes on one side. 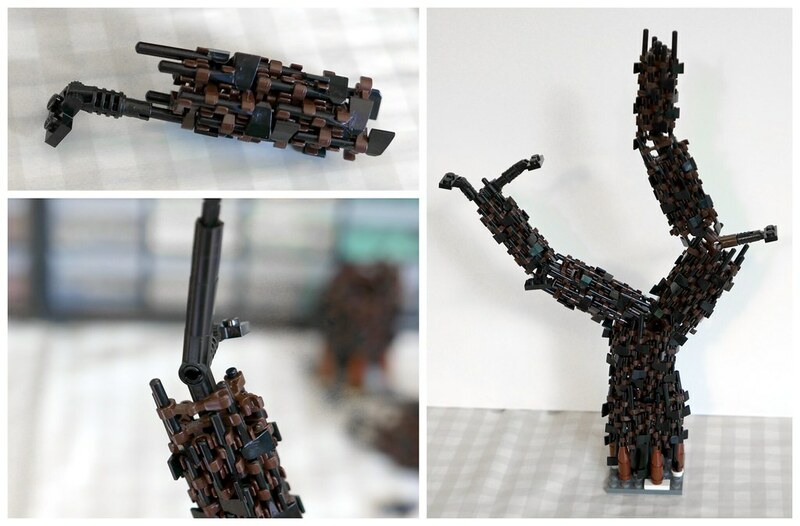 When doing this there will inevitably be some loose droid arm ends. This is fine, just move them so they fit with the shape we’re trying to accomplish. We then try to put the tube on again, with the longer part of the edge on the top. The result is a that the tube fits much better with the tree as seen on the right. We need leaves on the left side as well, but here we will use a different technique. First, let’s add another connector with a slight bend upwards as seen on the top left. We then create a leaf connection point that we can connect to the pinhole of the technic connector. If you happen to have any 41532 elements lying around you can use them instead (this is what I ended up using in the bottom right which is why it is not protruding as much). For the end of the branches we need some very thin tubes. These are the size 8 tubes, which are the smallest ones you can make with this technique. What is that you say? The technique for size 8 tubes are essentially the same as all other tubes? Good guess, but umm… no 🙂 Well, it’s pretty similar, except for one main difference: the orientation of the droid arm bends are all reversed! This means the droid arms will bend outwards instead of inwards as is the case in all the other tubes. Other than that the process is just like the others. 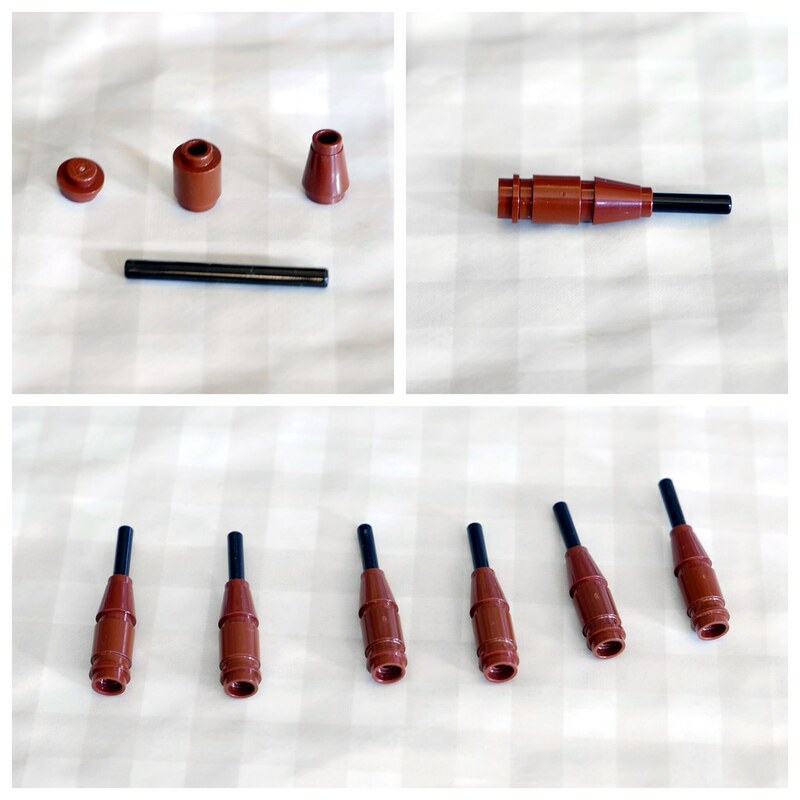 Remember that the size 8 tubes also can only fit the smooth, straight connectors, so we will build the inner structure with those here. 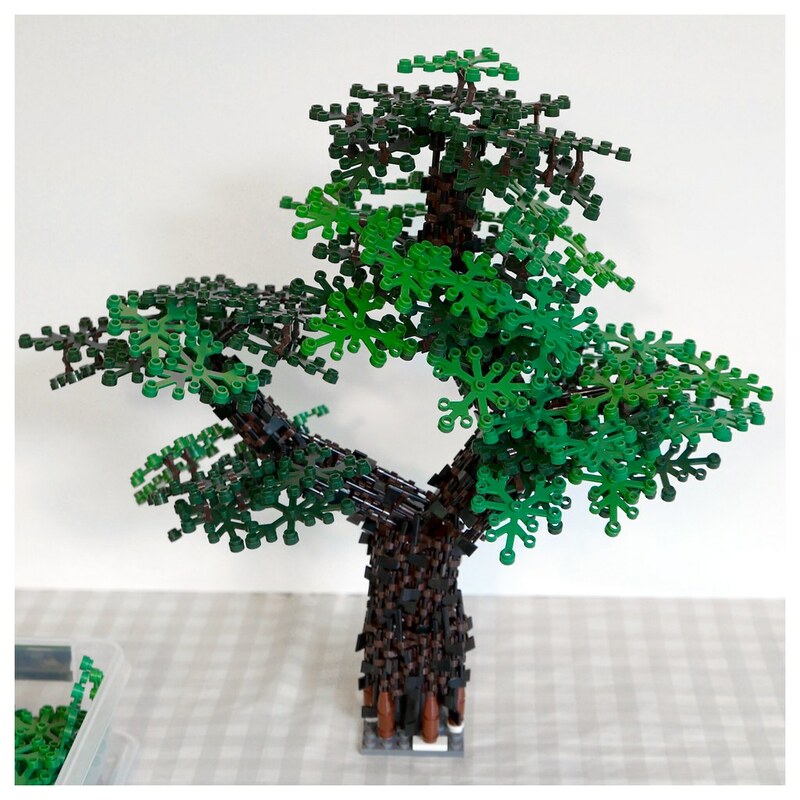 We would also like to attach leaves at the end of the branches, so let’s add some leaf connection points at the top of the size 8 tubes before we add them to the tree as seen in the top left. The hinges with axle hole can be put right on top of the axle handles. Another version is to use element 32039 to get a different angle, this can be seen on the left branch in the right picture. On the main trunk we will first add another size 12 tube (yes, we need to build one more) before putting on the size 8 on top. Let’s also add a connection point to the main trunk similar to the one added halfway up the left branch, that is, above the size 12 tube but below the size 8 tube. This time though, we will have it pointing to the back, so we can have leaves all around the tree. This is shown in the bottom left. Now things are starting to look like a proper tree, kind of 🙂 But the leaf connection on the extreme right looks a bit too bare. Let’s do something about that. We will build another really short size 8 tube that is to be attached on the rightmost little branch. Now it looks less bare. Also we add some more leaf connections at the very top of the tree. There are quite a few holes in the bark here and there. Don’t worry, we will deal with that later. Or… maybe not 😉 We’ll see! Ok, this is actually my favourite part of the tree building, since this is when the tree actually starts looking like a proper tree. It can also be one of the more frustrating parts, as foliage can be quite fragile, and it can sometimes be very hard to reach places where you want to add more leaves. Whatever the case, it is certainly a crucial step to tree building. 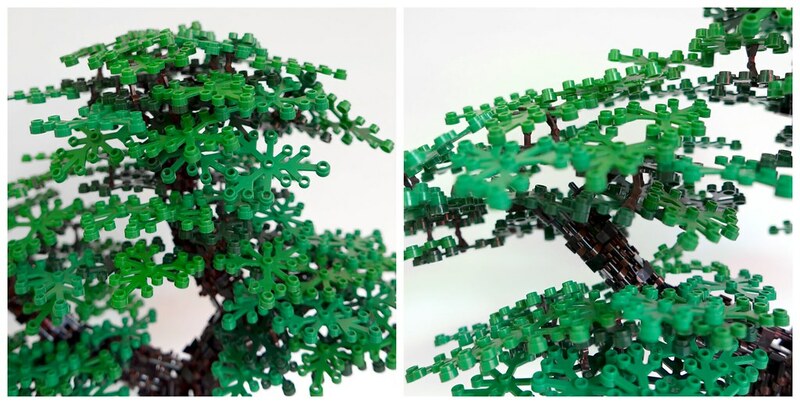 I have chosen to work with green and dark green for this tree. If you would like to use other colors, by all means, go ahead. I’m quite fond of the dark orange / dark red combination myself 🙂 We also need some droid arms for the foliage assembly. We start with the darker colour, as these will be the leaves shadowed by the others. A good way to start is to just connect a leaf element to each stud of the connection points. 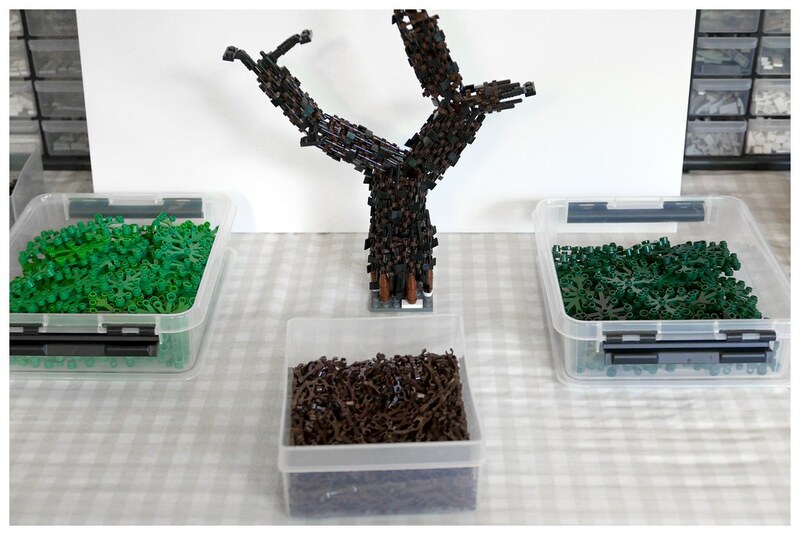 It is not shown in the picture, but at this point we should also put a 1×2 plate of the same colour as the leaves over the two studs where the leaves are connected. This will help keep the leaf elements in place. Now before adding more leaves I will show the method used to give volume to the foliage. Just attaching leaves to each other will give a very flat feel to the foliage, and it generally doesn’t look natural. 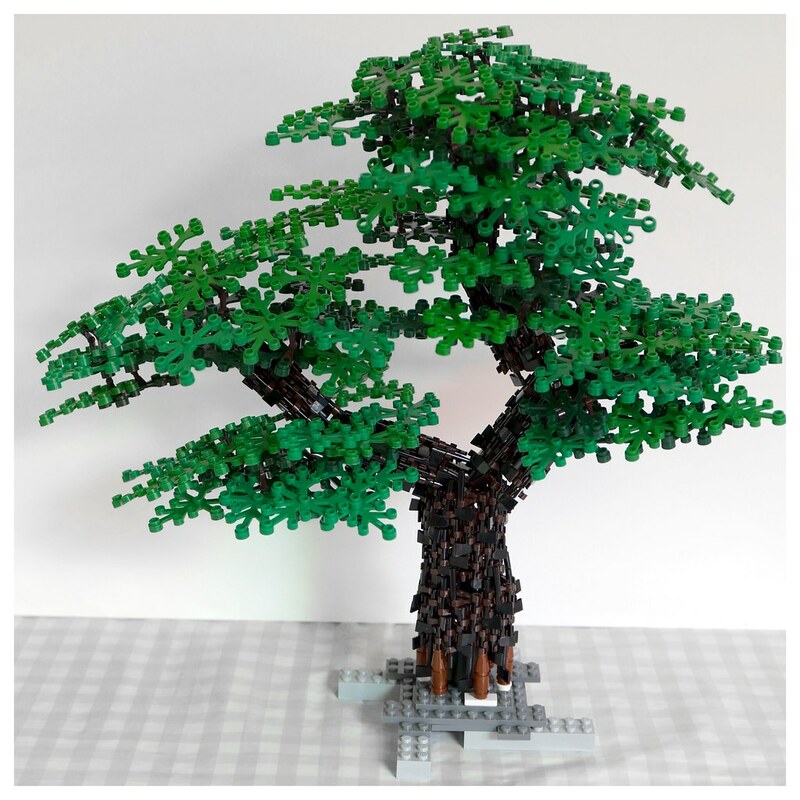 Real foliage has volume, and in order to achieve this, we either need to build loads of connection point for leaves all over the tree, which is not really possible with this technique. Or, we can create a vertical distance between leaf elements to generate more layers of leaves. We use droid arms for this. The droid arms can be attached to the “beams” of the leaf elements, and we can then attach another leaf element on the other end of the droid arms. Using two droid arms in parallel helps create a more stable connection between the two. Apart from creating a distance between the leaves this also gives the option of putting the leaves at different inclinations, which helps preventing the foliage from looking layered. You can also have the top leaf be turned 45 degrees compared to the bottom one, by attaching it to different “beams” as shown the right picture. In general, anything that helps the foliage look less structured is good. We are trying to create an organic looking tree here. Ok, back to building the foliage! Here we have first connected a few more leaf elements to the first ones we added. After that we use the droid arm method to created a few more layers to the tree, both above and below the leaves we already have. More leaves have been added. Try to keep it balanced, and add more where things look sparse. But don’t add too many layers upwards just yet. That is what the lighter color leaves are for. Around 50-75 leaves of the darker colour should be enough before switching to the lighter hue. Now we’ll start using the lighter color leaves. I just wanted to begin by showing this. As we now have already quite a number of leaves on the tree, things start to get more fragile. 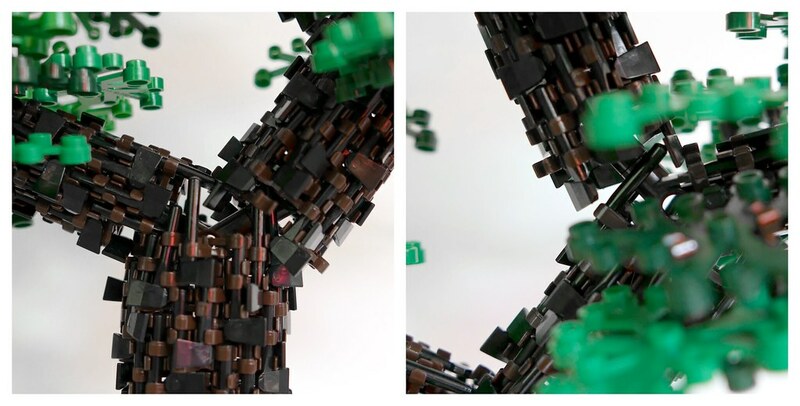 Attaching new leaves gets harder, especially when doing it with droid arms. So what I usually do it build them like this before attaching them. Do note that the thicker part of the droid arms is the one we attach to the leaf. This will then be attached on top of one of the darker leaves as we see fit. We will also need to support the bottom of the darker leaf while attaching, or things may fall apart. Here we have created a couple of new layers with lighter leaves on top of the darker ones. Here we have added a lot of leaves on the right side of the tree. 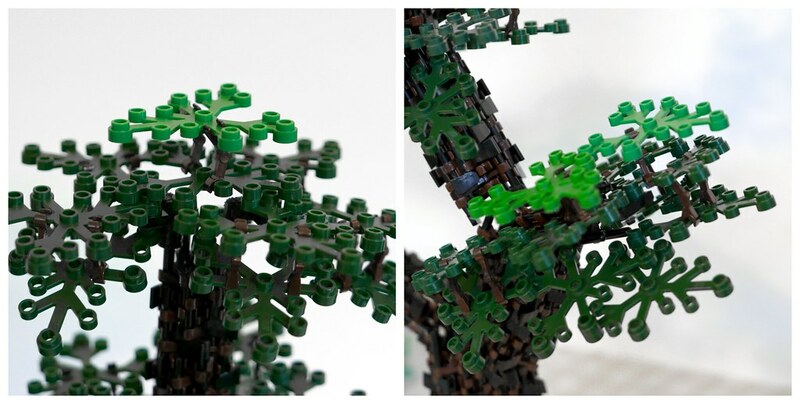 Once we have attached a leaf with droid arms we can just add more leaves to it by connecting normally with studs. Don’t be afraid to create long chains of leaves like this. If the leaves bend downwards from the weight that’s fine, it gives a nice curvature to the leaves and helps to make it look less structured. 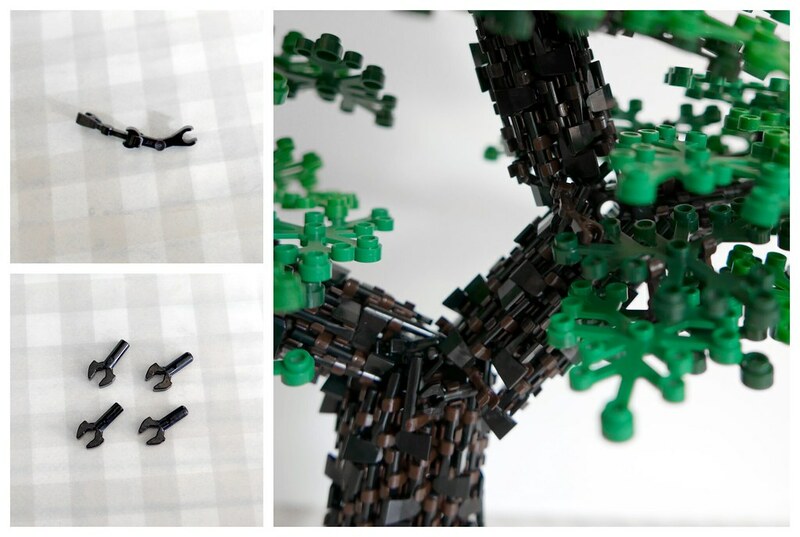 We can also attach some lighter leaves on top of the darker ones directly by studs. Now the foliage is pretty much done. There are probably 75-100 elements of the lighter colour used here. Note the layers and different degrees of inclination, which help give the tree a fuller look by obstructing the view through the foliage. Some closeups of the foliage to get an idea of what is going on. Ok, so we are pretty much done. But how about those cracks and gaps in the trunk that I mentioned we’d fix later? Well, at this point many of those are already either obscured by the foliage or they are no longer noticeable since the contrast between foliage and trunk is so much bigger. That being said, there are usually some things that need fixing. In the case of this tree it was at the branching points, which is often the case. At certain angles you can see through the tree, which is certainly not desirable. So how do we fix the cracks in the trunk? We fill them up with stuff 🙂 Essentially we can use anything that fits and sticks in black or dark brown color. Axes, droid arms or any combination of the two work well. I also like to use the little short bars with clips on them. Four of those can be assembled into a little ball that you can stick into little holes and crevices in the bark. Do note that pieces added this way have a tendency to fall out when the tree is moved. So use it sparsely, or make sure that the added pieces are firmly stuck. Now all we have to do is build a landscape to add the tree to. 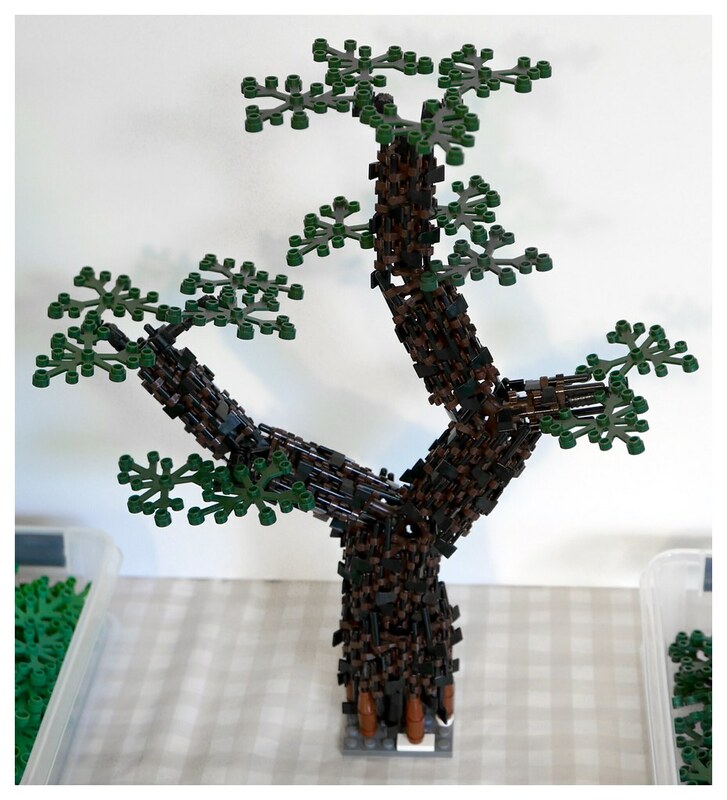 I have built quite a number of these trees since I developed the technique about a year ago, and though I do think it’s aesthetically pleasing, I find that the instability of it limits its usage quite a bit. It’s fine for just having and photographing, but bringing it to exhibitions is quite risky. I also think there are a lot of improvements that can be done to it, in particular when it comes to the supporting structure and foliage. 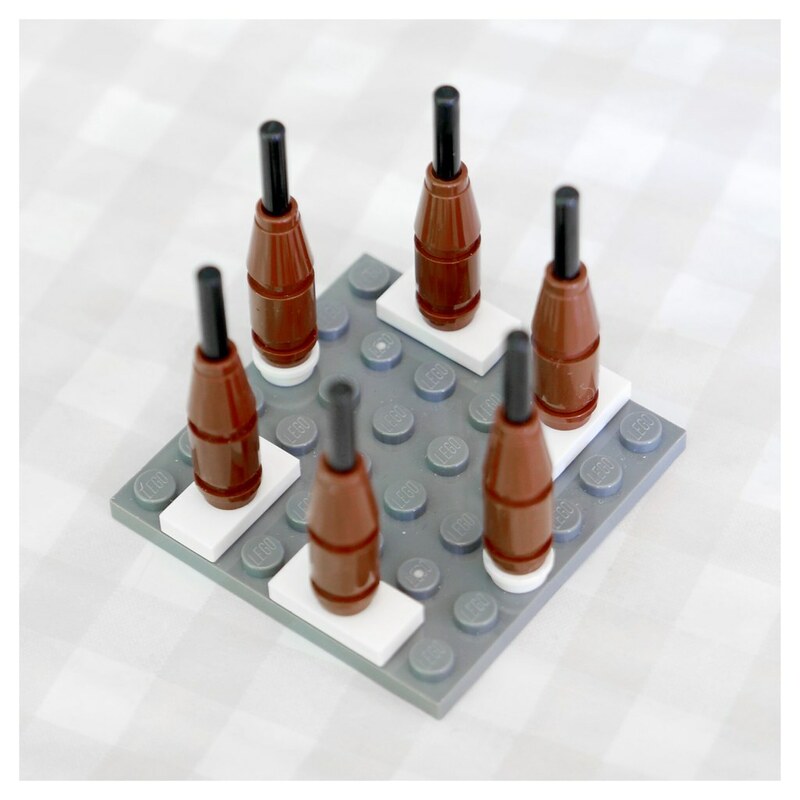 With all the awesome technic builds I see floating around, I’m sure there are plenty of people who have the knowhow to significantly improve the stability of the design.